Upolu Airport is located three miles northwest of the town of Hawi on the northern tip of the coast of the Big Island of Hawaii. On June 25, 1927 Executive Order No. 287 set aside 37.9 acres within the ahupuaa of Kealahewa for an airplane landing field for the United States Air Service to be under the control and management of the War Department and known as Suiter Field. The 37.9 acre area was previously deeded to the Territory of Hawaii by the Hawaii Mill and Plantation Company on June 17, 1927. The airport was subsequently named Suiter Field by the U.S. Army, in honor of 1st Lieutenant Wilbur C. Suiter of the 135th Aero Squadron in 1933. The dominant use of the Upolu Point Military Reservation was the Upolu Airport, and it was used as a landing field beginning in June 1927 by the United States Air Service under the control and management of the United States War Department. The airport was first licensed in 1928. The land was appropriated from the Territory of Hawaii by several Presidential Executive Orders. In the early days of aviation in Hawaii, the U.S. Signal Corps maintained a communication station at Suiter Field. Inter-Island Airways, which began passenger service in 1929, used the field as an emergency stop on its route to Hilo, as well as to provide air service to the district of Kohala. On June 26, 1929, Governor’s Executive Order No. 363 added 57.2 acres to Upolu Airport Landing Field to be under the control and management of the War Department. 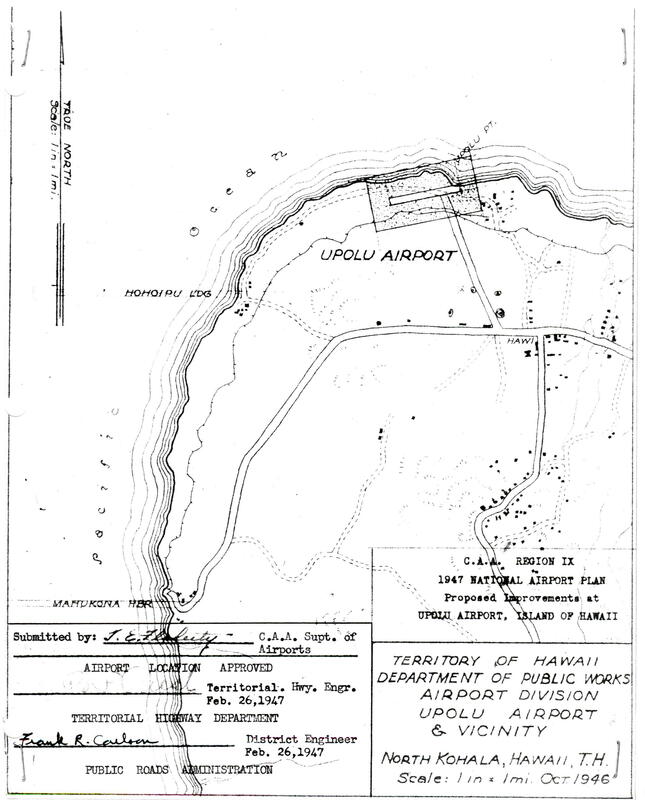 In December 1929, the Territorial Aeronautics Commission was shown blueprints which were secured from the Territorial Land Commissioner of the Upolu Aeroplane landing field at North Kohala, owned by the Federal government. With the consent of the Governor, the Commission approved working out a plan with the Federal government for the return of Upolu Point to the Territory. In January 1930, the War Department granted the Territory concurrent use of the Army landing field for official and commercial aviation use for a term of five years for Inter-Island Air Ways Ltd, according to Bureau of Conveyance records. Seven months later, about 97 percent of the land set aside for the military reservation was restored to the Territory. A couple of months later, about 95 acres were dedicated to establish the Upolu Airport under control of the Territory. 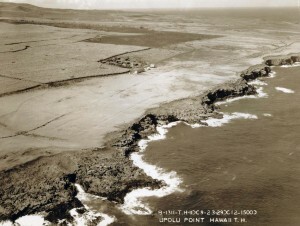 In March of 1930, the Superintendent of Public Works noted that improvements were needed badly at the Upolu Landing Field. Many ruts appeared on the surface and were hazardous to planes landing on the Mahukona side. On July 25, 1930 Presidential Executive Order No. 5406 returned 36.921 acres of the airport to the Territory of Hawaii. On September 18, 1930, Governor’s Executive Order No. 432 combined the 36.921 acres restored by PEO No. 5406 with 57.2 acres of government land abutting the western end of the airport to establish a territorial airport to be known as Upolu Airport (total net acres under Territorial control 94.121). On September 25, 1930 the TAC received Executive Order No. 432 setting aside land to be known as Upolu Airport under the control and management of the Territorial Aeronautical Commission. On November 23, 1930, Governor’s Executive Order No. 556 withdrew a 36.921 acre portion of Upolu Airport from Executive Order 287 as a “matter of housekeeping” to correct a duplication so as to retain the property under Territorial control. Presidential Executive Order No. 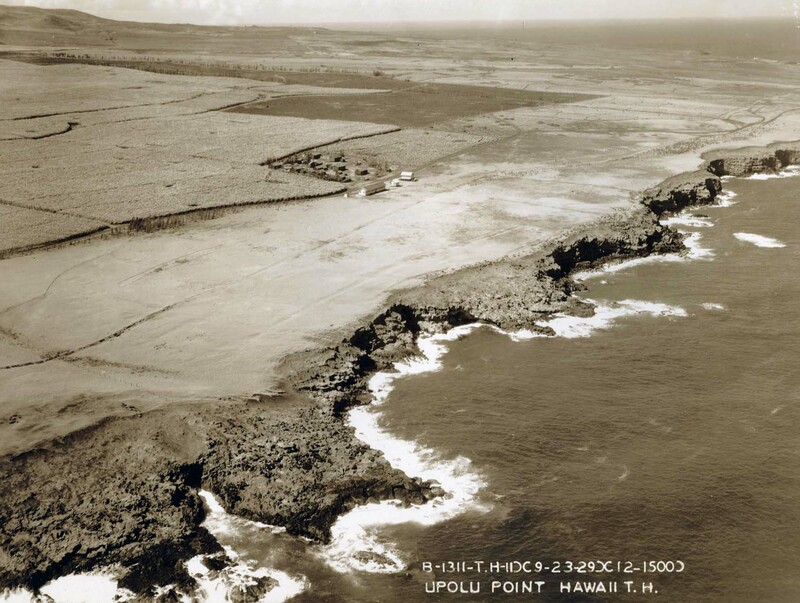 5528 dated January 7, 1931, returned 57.2 acres of Upolu Point Landing Field to the Territory. Governor’s Executive Order No. 556 dated November 23, 1932 withdrew 36 acres from Executive Order No. 287 per Presidential Executive Order No. 5406, returning Upolu Airport to the Territory for management by the Territorial Aeronautics Commission and retaining 0.979 acres for the War Department. Governor’s Executive Order No. 745 dated May 26,1937 withdrew and cancelled Executive Order No. 432. Governor’s Executive Order No. 749 transferred 2.672 acres of Upolu Airport to the U.S. War Department for military purposes. Governor’s Executive Order No. 922 dated January 4, 1941 set aside 94.674 acres for Upolu Airport. Governor’s Executive Order No. 924 dated February 3, 1941 transferred 0.868 acres to the U.S. for the Upolu Point Military Reservation. In 1935 the Upolu field was being maintained by FERA labor. This field was grass on a sandy soil and partially graded. The Army maintained a barracks and radio station at the field on Federal property. The Upolu Point Airport consisted of one large runway in the shape of an hour glass 3,500 feet long. The field, on account of its location on sloping ground, required heavy grading, which was about 50 percent complete in 1937. Runway paving 300 feet wide at center, 500 feet wide at each end and100 feet of grading on each side of the runway was planned. When the paving began the U.S. Army Barracks and Radio Station were moved to a new location. Upolu Airport was maintained by the Territory of Hawaii with FERA and WPA funds prior to 1937. From 1937 to 1939, additional WPA funds were expended in extending the runway to 3,500 feet and in making other improvements to the installation. On May 21, 1938 Presidential Executive Order No. 7893 transferred 0.979 acres back to the Territory. No appropriation was made by the 1939 Legislature for Territorial airports, so all construction ceased during the 1939-1941 biennium as only the Aviation Gasoline Tax was available. In the past year the tax amounted to $13,599. By 1939, the field was completed to the minimum requirements of the CAA and opened for traffic. A settlement of the filled portion required the closing of the field for a period of two months, but it was repaired and traffic resumed. The field consisted of one runway 2,800 by 300 feet wide and was paved 2,500 feet long by 100 feet wide. At the request of the Army, .868 acres was set aside for military use at Upolu Airport in 1940. In November 1940, preliminary plans and cost estimates were filed with the Civil Aeronautics Administration, and in December 1940 approval was received for a new Upolu Airport. Under the 1940 National Airport Act, the CAA made allocations totaling $332,000 for Upolu Airport ($210,000 in December 1940 and $122,000 in July 1941) but National Defense Program conditions in the Territory made the contemplated construction impossible and no portion of the amount was utilized for the project. In October 1941, the Governor and the Superintendent of Public Works signed a contract to maintain and operate the airport when finished. Before the bombing of Pearl Harbor on December 7, 1941, a contract had been let and work was ready to start on the new airport. No work was done after the War started and the funds were used on other projects. The CAA agreed to fulfill its contract after the war and agreed to advance additional funds to complete a flight strip 4,500 feet by 200 feet. During World War II, the Navy occupied Upolu Airport establishing a weather and communication station there. The facility was used as an auxiliary field to the Naval Air Station, Hilo, for field-carrier-landing practice and other training of carrier pilots. The runway was extended to 4,000-feet and housing provided by the Navy for military personnel operating the airport. A simulated deck of an aircraft carrier was installed and air-group pilots completed their training by qualifying in day and night deck landings before going aboard the carriers for combat duty. The Territory granted the USA occupancy and use of the airport from July 1944 to May 1947 for the exclusive use of naval and other military purposes. The U.S. government occupied the reservation itself until November 1952 at which time all remaining lands were restored to the Territory. In 1944, the original landing strip was reconstructed and enlarged by the Navy and commissioned as Naval Air Facility Upolu for carrier-plane training. Combined catapult and arresting gear were installed and the strip was utilized most intensively. In 1944, the Post War Planning Division of the Territorial Department of Public Works proposed extending the existing flight strip to 4,000-feet by 500 feet and the present paved runway, currently 2,500 feet by 100-feet to 4,500 feet by 200-feet when the airport was returned after the war. Other proposed work included paving with asphaltic concrete, boundary lights, range lights, contact lights, rotating beacon and code beacon, control panel, ground to plane radio equipment and an access road. The Governor presented the plan to the 1945 Legislature and requested $2,500 from the Legislature to purchase 10 acres of land for the airport. Upolu Airport was returned to the Territory by the Navy after the war, and air service was provided by scheduled and non-scheduled operators. Buildings formerly occupied by the Navy were rehabilitated for use as a terminal and for other purposes. On June 30, 1945 Presidential Executive Order No. 9582 exchanged 1.67 acres of U.S. government land at the airport for 1.67 acres of Territorial property at the Airport. On November 16, 1945, Governor’s Executive Order No. 1127 transferred 1.67 acres to the Territorial Department of Public Works. Act 32 of the 1947 Legislature, placed Upolu Airport under the management of the Hawaii Aeronautics Commission effective July 1, 1947. “Although Upolu Airport is adequately handling airplanes (including DC-3’s) at the present time (1947), the paving is deteriorating rapidly and complete reconstruction will be necessary at an early date,” reported the Superintendent of the Territorial Public Works Department. The narrow 2,500 foot strip originally constructed by the Territory was used for a time by Inter-Island Airways, Ltd. for small Sikorsky amphibians, but could not be used for large aircraft. “Present operations demonstrate the importance of the airport to the Kohala district. Without the airport it would be necessary for residents to go to Hilo for transportation to Honolulu. The trip to Hilo requires approximately three hours by automobile and is very tiring and expensive. “The Navy construction work on the runway was carried out under great pressure and in a manner not at all suitable for a permanent airport. Although the area has relatively high rainfall, the construction included practically no provision for drainage. The base-course is fairly adequate in thickness but the transverse drainage is very poor. The paved surface varies in thickness from two inches to only three-fourths of an inch and indications are that its deterioration will progressively increase at such rate as to make maintenance prohibitive within a year or two. The Superintendent of Public Works of the Territory indicated that the Territorial Administration proposed to recommend to the 1947 Legislature the appropriation of a sufficient sum for the accomplishment of the project. The November 1946 Territorial DPW Master Plan for Upolu included a 4,000 foot by 150 foot runway. The CAA Region IX 1947 National Airport Plan approved the proposed improvements at Upolu Airport. By 1948, the paved runway was 4,000 feet in length and Upolu was the only airport in that part of the island which met the requirements for scheduled airline operation. Hawaiian Airlines was the principal user of the airport and made one stop a day en route from Honolulu to Hilo, and one stop en route from Hilo to Honolulu. The Hawaii Aeronautics Commission authorized the expenditure of $2,000 at Upolu Airport to improve the terminal facilities for Trans-Pacific Airlines on May 3, 1949. Act 368, SLH 1949, appropriated $46,200 for paving and improvements. Hawaiian Airlines maintained a scheduled service to this field in 1949. It was the only airport on the Island of Hawaii, with the exception of Hilo, which met the requirements for scheduled airline operation. It was important as an alternate landing point when weather conditions at Hilo were unfavorable. The Upolu airfield always represented a problem in maintenance as the subsurface drainage was inadequate, causing the run-off from the slopes above to be trapped in the clay foundation. This condition continually caused settling and breaking up of the runway surface. By 1950 the airport was served by both the scheduled passenger airlines operating in the Territory. The field facilities were maintained by the Hawaii Aeronautics Commission; this included the runway, landing ramps, lighting system and water system. The work was accomplished by members of the Hilo staff or by private contract. Routine vegetation control was conducted by the Hilo staff. Hawaiian Airlines and Trans-Pacific Airlines each maintained their own terminal facilities. The Civil Aeronautics Administration completed the installation of a VOR station. The station was commissioned in January 1950 and has operated continuously since. The Hawaii Aeronautics Commission completed the installation of a standard airport rotating beacon light in June 1950. The light was commissioned on June 26 and will operate nightly hereafter. The Hawaii Aeronautics Commission’s Hilo staff installed new electrical cable and runway light fixtures in June 1950. The runway lights will be operated all night. The HAC approved the hiring of a full-time maintenance person at Upolu Airport on July 24, 1950. Repair and resurfacing of the runway at Upolu Airfield started in December 1950 at a cost of $54,581. A Jeep crash fire truck was put into operation at Upolu in January 1951. Resurfacing of the runway at Upolu Airport began in June 1951. Hawaiian Airlines requested a Quonset hut at Upolu for a freight terminal after they move into the new terminal in June 1951. A new joint passenger terminal was completed at Upolu Airport In June 1951. Cost: $27,433. An additional appropriation of $15,000 was approved out of the Fuel Tax Fund to complete necessary alterations and improvements to the Upolu terminal building and improvements to roadways and ground areas on September 24, 1951. 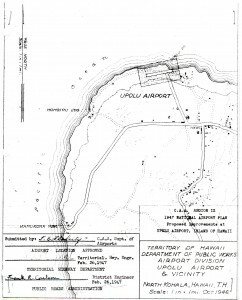 The HAC agreed on June 23, 1952 to lease 23 acres of land adjacent to the airport to Kohala Sugar Company for 15 years, subject to restrictions covering the airport, at $6 per acre. On November 25, 1952, Presidential Order No. 10414 transferred 3.54 acres to the Territory. Governor’s Executive Order No. 1770 dated December 26, 1956 withdrew 0.125 acres of land from Upolu Airport for leasing purposes. GEO No. 1772 withdrew 12.395 acres for leasing purposes. It was anticipated that with the opening of the new Kamuela Airport in Waimea a decrease in aircraft operations at Upolu would follow. On July 28, 1956, the HAC reported that Upolu Airport was unsafe and that it would cost approximately $345,000 to recondition the airport. There were three flights a week into Upolu. The HAC requested that the airlines report whether they intended to increase service to Upolu or discontinue it altogether. A public hearing was held by the HAC on the status of Upolu Airport. The Commission explained that the airport, although usable, was in very poor condition and would require general repair, drainage improvements and runway reconstruction which would cost a considerable amount of money. All those who spoke at the hearing were unanimously in favor of keeping the airport in operation. The HAC authorized the repair of a 30 foot by 50 foot portion of the damaged runway on February 28, 1957. The repairs necessary for the safe operation of Upolu Point had been completed and the airport continued operations. Only routine minor maintenance took place at the airport during the next decade. A project to seal-coat the runway was completed on November 14, 1968. Cost: $19,482. On October 1, 1970 the State Airports Division placed Keahole, Waimea-Kohala and Upolu airports under the control of a new position, the North Hawaii District Superintendent. Act 68, SLH 1971, appropriated $250,000 to resurface the runway. Act 202, SLH 1972, appropriated $325,000 for land, design and construction for runway resurfacing, acquisition of land for runway clear zones and reconstruction of the runway. Act 218, SLH 1973, appropriated $200,000 for reconstruction of the runway and land acquisition; and $20,000 to construct a new passenger and maintenance shelter. Act 218, SLH 1974, appropriated $400,000 for reconstruction of the runway and land acquisition; and $40,000 to construct a new passenger and maintenance shelter. Act 214, SLH 1979, appropriated $108,000 to provide potable water, electrical and sewer systems. A contract was awarded for airfield lighting and miscellaneous electrical works on February 24, 1975. This project included radio-controlled lighting which allowed a pilot to turn on runway lights from his aircraft by transmissions on a specified frequency of the aircraft radio. Cost: $18,882. Airfield lighting and miscellaneous electrical work was completed in August 1975. Since Upolu was unstaffed, this was a very important advance in safety, as well as a saving in electricity. In another project the runway was strengthened and other airfield improvements were completed on May 15, 1975. Cost: $147,754. Governor’s Executive Order No. 2773 dated June 30, 1975 set aside 4.54 acres for a clear zone easement at Hukiaa, North Kohala for Upolu Airport. Governor’s Executive Order No. 2828 dated March 23, 1977 cancelled EO 2773 and Governor’s Executive Order No. 2819 set aside 4.537 acres of land for a Clear Zone Easement. In the 1980s, the Legislature through Act 300, SLH 1980, appropriated $108,000 to provide potable water, electrical and sewer systems. A regular ground maintenance program was initiated to beautify the airport. Design began on a potable waterline from the highway to the airport terminal. Miscellaneous improvements were made in February 1988. Cost: $200,000. The lighting system was upgraded and new navigational aids were installed in February 1995. Cost: $445,577. The Upolu Airport Master Plan and Environmental Assessment were completed in March 1999 and published. The plan was prepared by Belt Collins Hawaii and Aries Consultants Ltd. The airport comprised 88.699 acres of land. The airfield included a single runway (7-25), taxiway and an aircraft parking apron. Runway 7-25 was 3,800 feet long and 75 feet wide and aligned in an east-northeast to west-southwest direction. The runway was equipped with medium intensity lights. A single taxiway, approximately 150 feet wide, connects the runway to the aircraft parking apron. There were taxiway lights at the turnarounds at each end of the runway and along the taxiway connection to the airport. There were no designated aircraft parking positions at the apron, which encompassed an area of approximately 25,000 square feet, except for two tie downs at the west end. There were two floodlights, one on each side of the aircraft parking apron. There was no control tower. It was a VFR airport. The terminal building encompassed 960 square feet and included a waiting area for commuter/air taxi services, restroom and DOT maintenance space. Scheduled commuter service had not been provided at the airport since 1986. There were no cargo facilities at Upolu Airport. There were no general aviation facilities except for the two tie downs on the west side of the aircraft parking apron. There were no aircraft rescue and fire fighting facilities at the airport. There was no fuel storage facility. Recommended capital improvements for Upolu Airport were divided into two phases. Recommended Phase I (1998-2005) improvements included land acquisition for a runway safety area and runway object free acres (1 acre) and runway protection zone (13 acres); construction of a 1,000 square foot HDOT maintenance building, $80,000; cesspool/septic tanks, $18,000; new chain link fencing, $29,000; and widening and paving of the airport access road (1.8 miles), $731,000. Recommended Phase II (2006-2020) improvements included land acquisition for future relocation of the passenger terminal; earthwork/grading for new taxiways and apron expansion, $300,000; construction of new parallel and entry/exit taxiways for Runway 7-25, $568,000; relocation of segmented circle and wind cone, $3,000; construction of new aircraft parking apron pavement, $108,000; development of general aviation hangar facilities, $60,000; extension of potable water system, $6,000; extension of electric/telephone/communication/lighting systems, $676,000; installation of fire protection system, glass fused to steel tank (30,000 gallons), $95,000; and installation of a new emergency electrical generator, $82,000. The Airport Layout Plan was approved by the FAA on July 28, 1999. Upolu Airport Air Traffic Statistics Upolo is a general aviation airport with limited commuter service.